김상만 고택은 이 지역의 부자인 김기중(金褀中)이 1895년(조선 고종 32년)에 안채, 사랑채, 헛간채를 짓고 1903년(광무 7년)에 안사랑채와 곳간채를 지었다. 그 후 1984년 대문채를 복원하여 현재와 같이 "ㅁ"자형 공간구성을 하고 있다. 지붕은 초창자의 부에 맞지 않게 안채, 사랑채, 대문채 등이 모두 초가로 되어 있는데 당시 혼란한 사회에서 소박하게 보이기 위해서 초가로 한 것으로 보이며, 이 지역에서 나는 천연재료인 샛대로 지붕을 이었다는 설도 있다. 부재를 보면 초가 대신 기왓장만 올려도 완연한 기와집으로 보일 정도로 반듯하여 당시 부잣집의 품격을 그대로 갖추고 있다. 이 고택은 부안, 고창 지방의 특색을 잘 나타내고 있으며 해안지방에서만 볼 수 있는 수법을 사용하고 있어 국가민속문화재로서의 보존가치가 매우 높은 것으로 평가되고 있다. 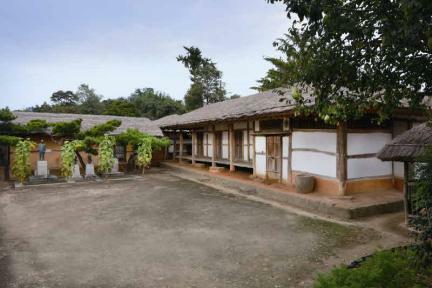 This thatched house is the place where politician Kim Seong-su (penname: Inchon, 1891-1955) spent his childhood. 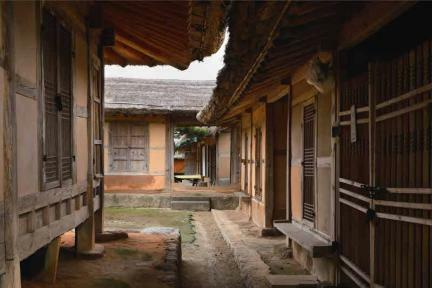 The anchae (women’s quarters), sarangchae (men’s quarters), and shed were built in the 32nd year of the reign of King Gojong of the Joseon Dynasty (1895), with the inner sarangchae and storage building added in the 7th year of the Korean Empire (1903). In 1984, the munganchae (gate quarters) was built, forming an overall square-shaped layout. 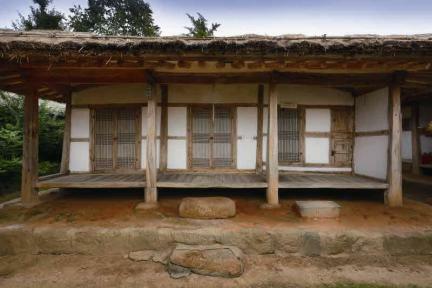 Facing the west, the anchae consists of a kitchen, a room, daecheong (main wooden floor), and a room arranged from the south side. The daecheong is rather large because the pillars are erected more sparsely than those in the room. 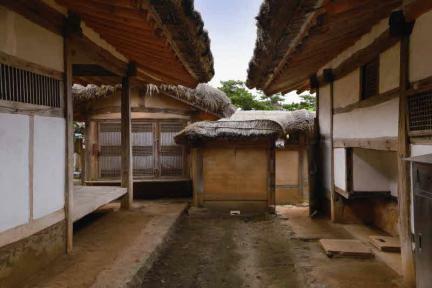 The smaller room has toenmaru (wood-floored veranda) in the front and a closet at the back. The sarangchae was built in a linear shape, facing the south. It has a unique structure, consisting of an end room and a closet room hidden by the back room. It has 3 rooms with toenmaru in front. 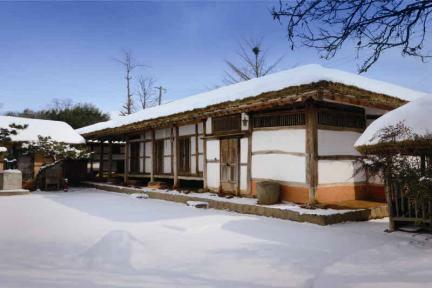 The storage building is situated linearly between the anchae and sarangchae. There is a gate on the west-end side, used as a passage between the anchae and sarangchae. The inner sarangchae is also facing west. It has 3 rooms with toenmaru on the front and back, respectively, and a closet on the wall. This house has the traditional architectural characteristics of the Buan and Gochang areas, which can be seen only in the coastal areas. It has been remodeled in modern style in 1982 but is still considered a valuable property because a famous figure at that time, who served as vice president of Korea, spent his childhood at this house. ※ Viewing of the cultural property above is usually available anytime but may be limited depending on the owner’s personal circumstances.